The hotel is located in a perfect position for me next to the shopping centre, we are opening a new store in the Designer outlet and I will be visiting the centre every two weeks and looking for somewhere to say. we got an early check in which meant after a super long drive we got to spruce up and get changed before we went to a wedding reception. staff were really accommodating and even the housekeepers were really friendly making an effort to say hello and wish us happy travels! The bistro were very accommodating to me being vegan and made me a beautiful vegetable tikka with rice, poppadums and nan bread. The reception staff were extremely helpful. The pool and sauna and gym were were relaxing. It is also easy to get into the centre of Edinburgh or equally to visit Lothian. Very comfortable bed, a lot of parking spaces, close proximity to local shops. As ever, we found the staff very courteous and efficient and there is plenty parking space. 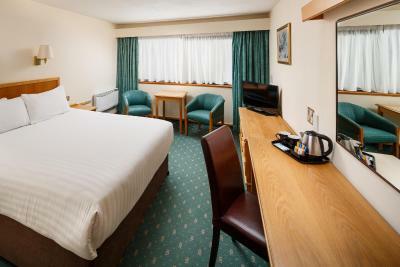 Mercure Livingston Hotel This rating is a reflection of how the property compares to the industry standard when it comes to price, facilities and services available. It's based on a self-evaluation by the property. Use this rating to help choose your stay! The Mercure Livingston is a 15-minute drive from Edinburgh Airport and 2 miles from junction 3 of the M8 motorway. It has a brasserie, a restaurant, an indoor pool, a gym, a sauna, and free parking. Complimentary high speed WiFi is available throughout the property. 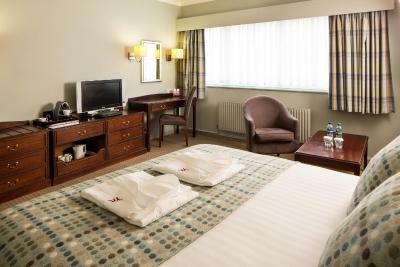 Each room at the Mercure Livingston has an private bathroom and a flat-screen TV. Most rooms look out over the hotel's lawns and courtyard garden. Interconnecting rooms are also available upon request. 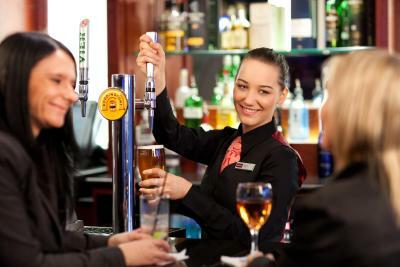 The brasserie, bar and restaurant offer modern food and a range of hot, cold and alcoholic drinks. The room service menu is available 24-hour a day. Leisure facilities at the hotel also include a steam room. Beecraigs Country Park is nearby, as well as other family attractions. 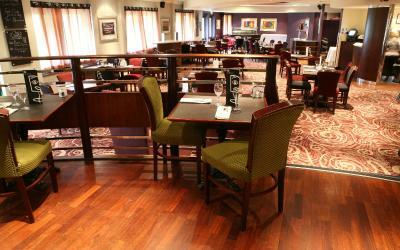 The Mercure Livingston Hotel is a short walk from the Designer Outlet and the shops. 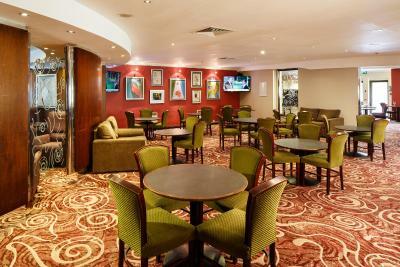 When would you like to stay at Mercure Livingston Hotel? Rooms feature a flat-screen TV, free high-speed WiFi, tea/coffee making facilities and a private bathroom with complimentary toiletries. 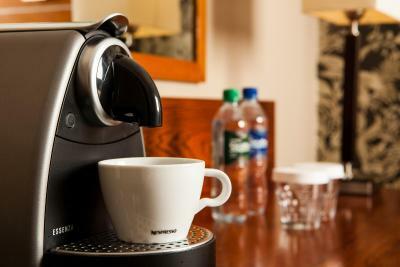 This room includes free WiFi, a flat-screen TV and a Nespresso coffee machine. It also offers a newspaper. The private bathroom offers free toiletries and a hairdryer, along with bathrobes and slippers. This room includes a flat-screen TV, free high-speed WiFi and tea and coffee-making facilities. The private bathroom has a hairdryer. This room sleeps 2 adults and 2 children. House Rules Mercure Livingston Hotel takes special requests – add in the next step! Mercure Livingston Hotel accepts these cards and reserves the right to temporarily hold an amount prior to arrival. Please note that the same payment card used to make the booking must be presented upon check-in at the hotel. The room was cold as there was no heating. The heater did seem to work. Only had breakfast which was so so. The mixer shower was a bit tricky to get the right temperature, possible scald risk for children. Great location, lovely comfy beds. Food was awful I got raw fish one night next night I got a poor steak pie. Decided not to dine there for the rest of my stay. One of the ladies at reception on check out was rude to myself and another person checking out at the same time. 3 times my room door was left open after housekeeping. Expensive breakfast, only few channels on TV. Restaurant meal ok-ish. Some of my fish platter overcooked and some underdone and greasy. £7 for small glass of wine seemed a bit excessive although my daughter enjoyed it. Hotel decor and carpets are a little tired. Breakfast poor. Changing rooms at pool too small. Steam room not working. GREAT location for the shopping centres.